Telangana Chief Minister K. Chandrasekhar Rao's birthday is being celebrated in a grand manner in Hyderabad's Jala Vihar. Various leaders of his Telangana Rashtra Samithi (TRS) party wished the leader on his 64th birthday, even as greetings and wishes poured in on his social media accounts. This is the first time that the birthday of KCR, as he is commonly called, is being celebrated on this scale ever since he assumed the office in 2014. Rao played a key role in the creation of the Telangana state after the bifurcation of Andhra Pradesh. Deputy Chief Minister Mohammad Mahmood Ali was amongst the first leaders to wish KCR. 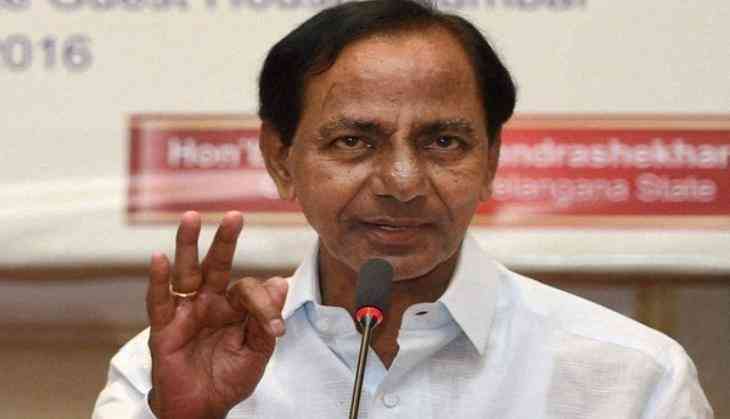 Speaking to ANI, Ali praised the Chief Minister, adding that KCR contributed a lot in the formation of Telangana, while always aiming for the development of the state. Ali said, "Telangana is a very young state and now our Chief Minister's main aim is to be the number one state in the country. Today we can see the brotherhood between Hindus and Muslims just because of him. Our state is a state where there are no disparities between any religions. Today on account of his birthday we wish him all the success." Another senior leader of the TRS, Talasani Srinivas Yadav, organised various programmes on the occasion of the Chief Minister's birthday. Yadav said,"Today we have organised a blood donation camp where several members participated in this camp. We are even distributing saris and sewing machines to women and a wheelchair to the handicapped on account of Chief Minister's birthday. Not only this, we are even celebrating his birthday evening in a temple and now we are cutting the cake and also providing lunch for the public." Rao was born on 17 February 1954 in the Medak District of what is now in Telangana.